I've already drawn 12 pictures of the angel series. Next, I would like to draw fantasy and mysterious world which I saw in my dreams or imagined when I was a child. I picked up the memos which I simply sketched to remember long time ago , and now, I'm enjoying imagining the colors and layout of the pictures. I also found the memo which I sketched during high school. I feel really nostalgic. I have a lot of messages in this picture. There are so many messages, so, I can’t describe all here.. 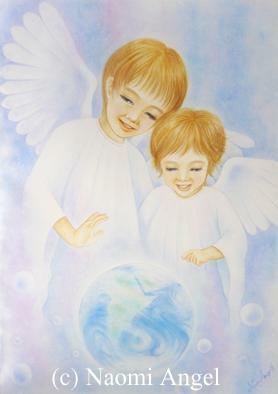 The impetus that I drew this picture is the thanks of my 2 cute angelic nephews. When the older one of them was just 2 years old, he was playing with a globe, and he told us a mystery story. According to his story, before he were born to the Earth, he was flowing in the universe with his younger brother, and they were looking down the Earth. And, he pointed to the Japan where their father and mother live, and said his brother, “I go first. You will come later after me.” Then, flew to the Earth. If the memory was true, what a beautiful and wonderful story ! We and our children are also all pure beings. We might have looked down the beautiful blue Earth from the universe, and said “Let’s go there, and let’s be happy together and make a better planet !”, then flown to the Earth with each our aspiration and will. I watched ""IRON MAN"" on the last Sunday. I heard it had become a big hit in US, and my friend said "that's really fun !" and recommended me it. Yeah, I found out it's true. Recent American comic movies are made for adults in Hollywood, I think those are great and very interesting to watch ! Batman, Spiderman, Superman Returns, … and so on..
Today, I talk about one movie. In fact, I really love movies ! Recently, I go to see 4 movies per month at the theater. I also watch DVDs a lot. The best movie which I watched in this year is “August Rush”. Freddie Highmore is the main actor, and Keri Russell, Jonathan Rhys Meyers, Terrence Howard and Robin Williams also act in the film. One 11 years old boy grew up in the foster home for 11 years and 16 days. He is counting the date every day until he can meet the parents. He believes to be able to meet his parents through music. His parents are a classic musician (mother) and a rock singer (father), they couldn’t be allowed to be with, by her father. One night, a sound leads the boy, he leaves the foster home and goes to NY city to find his parents. He has amazing hearing and sense of sound, and his music talent gets to be known as “August Rush”. And… well, from here, I’ll secret for you. Expression of sound and mind is very wonderful in this movie. Also, the flow of the story's development is very natural, and grabs our hearts. And music is great and amazing ! I really like the boy and their parents believe the souls connection from heart, using music as their telepathy. I had a lot of tear from the beginning of the story.. I also believe the souls connection and hearts connection. If you haven’t seen it yet, please watch ! I already ordered the DVD ! Hi, everyone, how are you ? It's sunny, today, I'm so happy. It's about one of my angel pictures, "Confidence" (a green angel). Reference: Diary 14th Sep 2008. One of my friends, “Yuru” who is an aura therapist commented about my green angel. Thank you for the nice angel’s pictures, your warm words and heart, always. 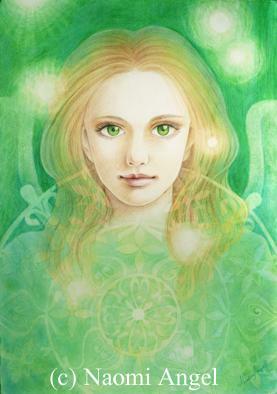 The green of the angel is the color of heart chakra which affirms and accepts yourself. In fact, I didn’t know heart chakra is green. After I completed to draw the angel, I knew about it later when I read the book of Dreen Virtue; “Chakra Clearing”. I got surprised a little bit. I believe angels or god are always by your side and protect us. They gave me a wonderful inspiration. I drew this angel for the people who are lost in their life, don’t know what they want to do, what they should choose as their commission. In fact, this picture was also drawn for myself. She brings out our blessed “strong will” = “commission” and “purpose of life” which our souls remember. Believe your way, stare forward and step forward…..
She is also a great angel for me to make me have courage and guide me.